Many plates carried the fictitious titles of 'chief', 'duke', 'prince', 'king' or 'queen', since there is no hereditary authority or aristocracy amongst them traditionally McCarthy, Wiradjuri Heritage Study, 2002. Landholders, particularly those with large pastoral runs, started the practice of presenting Aboriginal chiefs with a symbol of prestige and rank among their fellows. These 'crowns', shaped like breastplates, were usually worn from a chain slung around the wearer's neck. Breast or 'King' plates were also awarded to Aborigines for services to the Colony. The Devlin family settled in Wagga Wagga during the 1840s-50s. 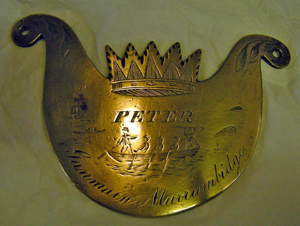 Sometime during the 1860s, they conferred a brass breastplate to Peter, a local Wiradjuri man. According to the Wiradjuri Heritage Study (published in 2002), this may have been of great significance, as Peter may have been the same one who together with Jemmie, guided Charles Sturt and his party from Wantabadgery to Mount Arthur. The breastplate, from Ganmain Station, is interesting for its depiction of a 19th century whaling vessel. Apparently this symbolised the Devlin family's earlier connection with the whaling industry. Elsie Devlin, granddaughter of James Devlin (1807 - 1875) the original squatter on Ganmain Station, indicated that the wearers of such plates were very proud of them. If the King of England were ever mentioned, the Aboriginal wearer of a breastplate would point to their 'crown' and say "me, I King here". According to David Kaus of the National Museum of Australia, breastplates are truly cross-cultural historical items and are illustrative of Aboriginal-white relations from colonial times until well into the 20th century. Documents from the 19th century historical record contain very little information about specific Aboriginal people. These historical breastplates are important, as they provide a material link to particular individuals within Australia's indigenous culture. The King Peter breastplate is a piece of great social and spiritual significance within the Museum of the Riverina's indigenous and historical collection. It crosses cultural boundaries - it is significant to the telling of Wiradjuri history, but also represents the history of Wagga's early pioneers, being part of the Devlin family collection.